Not that AMC has turned the dark cult comic the Walking Dead into one of its biggest hit shows they have officially put into development the long-rumored TV version of Garth Ennis and Steve Dillon’s twisted and off the wall western 1990s cult comic series Preacher. 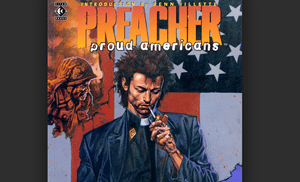 Preacher tells the story of Jesse Custer, a preacher in the small Texas town of Annville. Custer was accidentally possessed by the supernatural creature named Genesis in an incident which killed his entire congregation and flattened his church. Custer, driven by a strong sense of right and wrong, goes on a journey across the United States attempting to (literally) find God, who abandoned Heaven the moment Genesis was born. He also begins to discover the truth about his new powers. They allow him, when he wills it, to command the obedience of those who hear and comprehend his words. He is joined by his old girlfriend Tulip O’Hare, as well as a hard-drinking Irish vampire named Cassidy. During the course of their journeys, the three encounter enemies and obstacles both sacred and profane, including: the Saint of Killers, an invincible, quick-drawing, perfect-aiming, come-lately Angel of Death answering only to “He who sits on the throne”; a disfigured suicide attempt survivor turned rock-star named Arseface; a serial-killer called the ‘Reaver-Cleaver’; The Grail, a secret organization controlling the governments of the world and protecting the bloodline of Jesus; Herr Starr, ostensible Allfather of the Grail, a megalomaniac with a penchant for prostitutes, who wishes to use Custer for his own ends; several fallen angels; and Jesse’s own redneck ‘family’ — particularly his nasty Cajun grandmother, her mighty bodyguard Jody, and the ‘animal-loving’ (and the mean loving) T.C. Sam Catlin (Breaking Bad) will serve as executive producer and showrunner, while Seth Rogen and Evan Goldberg (This is the End) will executive produce and write the pilot draft. Whether the comedy duo fully understand the twisted comic remains to be seen, but AMC should light a candle in hopes that their latest development gains steam.